How do I get started learning jazz piano as an adult? Discover how to get started with jazz piano as an adult. 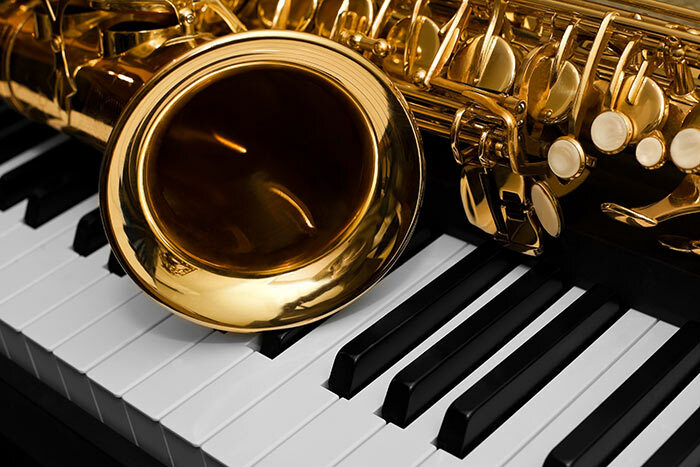 In this article you will get a much deeper understanding how jazz works! Learning to play jazz piano as an adult is one of the most rewarding things you can do! It is, however, important that you understand the process of getting started with jazz piano. Jazz piano is not easy to master, it requires a lot of practice and self-discipline. It can be downright arduous at times, but the rewards are humongous once you get it right! In this article, I will do my utmost to help you understand the journey and process of learning to play jazz piano as an adult. To become proficient at playing jazz piano, you need a working command of voicings, melodic lines as well as the concept of superimposition. All these elements require a tremendous amount of actual memorisation. Therefore, it will definitely help to think of learning jazz piano in terms of an exciting journey rather than a destination. You cannot really speed up the process too much. The reason for this, is you need to know your chords or voicings inside-out, and be able to use them in a real “live” situation on the spot. Your knowledge of jazz voicings, lines and superimposition needs to be embedded in your deep long-term memory and ready to be used at will. At The London Piano Institute, we help all our jazz students by constant (fun) drills and practice to recall important voicings, lines and superimposition. Unfortunately (and fortunately! ), there is no quick method here. Memorisation tricks go so far, but will not help you perform at will and creatively in a “live” situation. The greatest secret here, is to enjoy the journey! There is absolutely no doubt, that great jazz education will help you achieve your goals much quicker than self-study. You may not be able to practice 10-12 hours a day in the likes of John Coltrane and that is why you need someone to help you get there! Once you get the fire of jazz in your belly, and you have the time, you can up your practice time to 90 minutes plus per day! Jazz may be an arduous style to learn but with dedication it can be done! So make sure you get excellent tuition – it is really the first step to your jazz success! We offer students jazz tuition in the City and Mayfair in central London. Find out about our in-house courses here. Alternatively, you can also explore online jazz Skype piano lessons from anywhere in the world with us. Even if you do not study with us, find someone great to help you, and stick with a great teacher for at least five years! That will really help you improve! Listening to great jazz with intent will help you get the “jazz feel”! Whenever a student asks me what is the first step to learning jazz, I always reply: listen, listen, listen. By immersing yourself in jazz music, you will get a “feel” for jazz! It is also important to note that listening only to jazz piano is not advised. You want to immerse yourself in the language of jazz playing as a whole. So listen to lots of different types of jazz. Listen to jazz played on a vibraphone. Gary Burton is the master of this style! It is amazing what is possible if you search and listen! Make sure you listen to lots and lots of jazz! In fact, during my University years when I studied jazz, I made a point of ONLY listening to jazz during my first year of studies. I desperately needed to get acquainted with the style in order to excel with my studies. Jazz is rhythmically the polar opposite of these styles and that is why you need to listen, listen and listen some more! So take out your favourite device and create a repertoire of jazz to listen to! Improvisation requires a complete understanding of chords, progressions and how to play through them! Learning to improvise is definitely a wonderful experience. In the early days, you should look at the blues scale as well as the pentatonic scale and start with easy improvisation. As your experience grows, move to more intricate harmonic movements and expand your knowledge. Learning how to improvise well, requires a complete understanding of harmony, melody and how they interact. At a master level, you basically become a composer on the spot! That means, you need to have a very large selection of melodic devices and options at your disposal in order to create melodies on the spot. That is why it is difficult! Doable? Absolutely, but it requires time, effort and application! The art of accompaniment in jazz, is an aspect of jazz performance that is difficult to master. When we first learn how to play an instrument, we usually focus on being heard and on the art of improvisation. When you accompany others in a jazz setting, your role as a jazz pianist is to very subtly provide a solid harmonic and rhythmic background for others to solo over. This requires humility, teamwork and a willingness to let others shine! When you comp (accompany) in jazz, the secret is to make the soloist or singer sound great. You need to really listen to their improvisation or singing and then accompany accordingly. You should make it easy for them to improvise or to sing or play the melody. Your role here is to provide a solid back end – your role is to support! The best way to learn about jazz comping (accompaniment), is to listen to great jazz playing. Count Basie was one of the greatest jazz pianists and leaders in big band jazz. Did you know he was initially a drummer? You can also listen to Herbie Hancock and McCoy Tyner, as they both have a more aggressive style of accompaniment. You can learn a tremendous amount by listening to both spares and aggressive styles of accompaniment. Remember jazz is an individual art. No two jazz players are alike. Each jazz artist will have his or her own flavour of accompaniment. In the early days of your jazz education, I would recommend copying the greats and incorporating their ideas into your own playing. Of course, as an adult jazz piano student, listening to a lot of jazz is the best course of action! You will find accompaniment and the art of comping very difficult in the early days. That is why I recommend listening again and again. By listening, you will develop your ear and learn the art of comping! Once you have developed a feel for comping, then you can try it out at the piano! Success comes to those who persevere! Structure and form is everything in jazz! In one sense, jazz is very simplistic. The usual practice is to play the melody and then take turns soloing over the form of the song. As each instrumentalist gets a chance to improvise, nothing changes in terms of the structure and form. Of course, to improvise successfully over the changes, and make beautiful music is really not easy at all! That is the challenge or game of jazz. You have a set structure, and you have to improvise over the underlying harmonic changes. In addition, during a live performance it is easy to lose your place in the structure. That is why form and structure is everything in jazz. You need a perfect roadmap of the composition inside your mind’s eye at all times! Five steps to getting started! By listening to jazz you are attuning yourself to the sound and feel of jazz. As a budding jazz piano student, you need to immerse yourself in the language and the culture of jazz. I would recommend listening to jazz whilst studying the history of jazz. There is a book by Ted Gioia called “The History of Jazz”. You can purchase that book on Amazon here. Listen to jazz starting with ragtime and the blues. After that you can listen to the early 1910s, combining earlier brass-band marches, French quadrilles, biguine, ragtime and blues with collective polyphonic improvisation. Then listen to big-band and swing jazz. Make sure you listen to Duke Ellington – he was and is a major influence on jazz! Finally, you can get familiar with what we call “musician’s music” in jazz – Bebop. Bebop is a musical style that is actually more of an art form then a commercial genre. As a bebop musician you can showcase your musical talents and improvisational abilities without compromise. In bebop you do not need to only “play for the audience”! From the 1950s onwards, jazz musicians also expanded harmonic possibilities. Listen especially to Bill Evans amongst others. Eventually jazz moved to modality and finally it moved to free jazz. Free jazz is an avant-garde form of jazz. You may not like avant-garde jazz, but do listen to all styles of jazz in order to immerse yourself in the process of learning jazz! Taking jazz piano lessons with an excellent jazz piano teacher is the quickest way to learn how to play jazz! By studying with a jazz instructor who knows all the ins and outs of jazz, you will make much faster progress than learning by yourself. At The London Piano Institute, we have world-class jazz piano instructors who specialise in helping adults to learn jazz. The good news is – you do not need any prior experience. You also do not need to study classical music prior to starting jazz. You can start as a total beginner, and learn the intricacies as well as the simplicities of this beautiful language. We provide jazz piano lessons globally via Skype and Facetime. The greatest thing about learning to play jazz with a top-notch instructor is that you feel supported. You feel that someone is there for you every step of the way! When you study jazz piano with an expert, then you can expect results and make fast progress! You can find out more about our jazz piano courses here. Everything in jazz is based on cycles. Become a master of the I IV VII III VI II V I progression and you master jazz! You see, jazz is quite predictable! Jazz is actually easy, once you get the mechanics sorted! Yes, making beautiful music takes lots of wisdom, time and experience. It is not really complex. But you do need a working understanding of chords, arpeggios and scales and how they relate over and across the different harmonic cycles. The blues is a predecessor to jazz. Blues and jazz have lots in common. As a jazz player, you need to understand blues. In my opinion, learning to play blues is a lot easier than learning to play jazz. It is probably wise to start with the C Blues Scale. You can then play that simple tritone (representing the chord C Dominant 7 or C E G Bb) and improvise using the C Blues Scale. Do not worry about sounding fantastic, just give it a go. If you give it a go, you will get a little closer to what it feels like to improvise! Small baby steps in the beginning is the key to becoming better! Do not expect miracles or overnight success…. Stick at it, follow your teacher and do your daily practice! Remember, only practice on the days that you eat! Step 5: Make the standards your best friends! Once you have made some progress in your jazz playing then it is time to get to know the standards. Jazz standards are made up of a compilation of famous show tunes (and other tunes) that have become “standards” in jazz repertoire over decades. You should find the I VI VIII III VI II V I cycle prominent throughout a lot of jazz standards. This second edition features a magnificent compilation of over 250 standards of jazz repertoire in new easy-to-read authentic hand-written jazz engravings, including: Ain’t Misbehavin’ * Angel Eyes * Bein’ Green * Blue Skies * Brazil * Crazy He Calls Me * Desafinado (Off Key) * Fever * Good Morning Heartache * Here’s That Rainy Day * How High the Moon * I Can’t Give You Anything but Love * I Got It Bad and That Ain’t Good * I’ll Be Around * I’m Beginning to See the Light * I’ve Grown Accustomed to Her Face * Imagination * It Don’t Mean a Thing (If It Ain’t Got That Swing) * It’s Only a Paper Moon * Just in Time * Lazy River * Midnight Sun * My Favorite Things * My Funny Valentine * Mood Indigo * Moonglow * Moon River * Old Devil Moon * People * Route 66 * Satin Doll * Sophisticated Lady * Speak Low * Star Dust * There Is No Greater Love * When Sunny Gets Blue * Witchcraft * and more. They are basically over 250 songs in the book. Of course, when learning you do not need to get to know 250 tunes! Once you master the tools of the jazz trade, then it is time to apply the concepts over the tunes! As you can see, learning to play jazz is a tremendous amount of hard work. The secret is approaching it as a fascinating journey! Take the first step and the rest will follow! Make sure you learn how to play jazz with an excellent instructor! Once again you can find details about what we provide here. I would like to remind you again – listen listen listen – jazz is all about developing your ear and getting an understanding of the structure and form of the particular repertoire in question. I wish you the greatest success in your jazz quest! May you achieve all your dreams! Learn how to get started learning jazz piano as an adult! Never, never, never give up! Your piano success is just around the corner! Group piano lessons in London are fun - discover why you should join! 6 Piano lesson myths - the things we want you to know! Can adults learn how to play the piano? I have never played before should I be concerned about learning the piano as a beginner? Can playing the piano increase your IQ? Practise in a distraction free environment dedicated to practising the piano. Group versus Solo – Which Sort of Lesson is Best for You? 10 Reasons Why You Don’t Need Any Prior Experience to Start Learning the Piano! The importance of the II V I progression in jazz!